Wifi Cabs offers you the opportunity to travel places with your friends and family using Minibus service in Vizag. 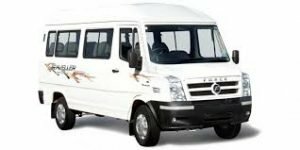 Our fleet of world class minibus rides facilitates you with just the right legspace in comparison to others in town, accommodating a fairly large group for a long ride across the city of Vizag and beyond. The idea behind providing you with a minibus for a cherishing trip is to help you travel with your dear ones whose presence make a difference in your well being. In fact the Indian tradition demands going for pilgrimages and spiritual explorations with the company who share the same wavelength as you, so that one can relish the process of sharing the wisdom earned. We ensure a compelling spiritual journey to Arasavalli, Annavaram, Simhachalam with your dear ones in a comfortable and classy Mini bus, unlike travelling by our fleet of luxurious SUV or Sedan in divided groups. In fact the culture of togetherness calls for travelling in unison during different auspicious occasions like marriage. More than the norms, what becomes important then is the fun filled times spent and the memories created, the essence of which will soothe us in times to come. Lastly, there is nothing like travelling together if you wish to cut down on your budget! So stack the penny in your pocket, while you spread your wings and set out on an escapade with your confidantes!